Why You Should Design Your Database to Optimise for Statistics – Java, SQL and jOOQ. In other words, most of your transactions are probably small things like small payments in a restaurant (around USD -50.00 for example), or on the other side, you’ll have the restaurant, which receives the payment (e.g. around USD +50.00 for example). 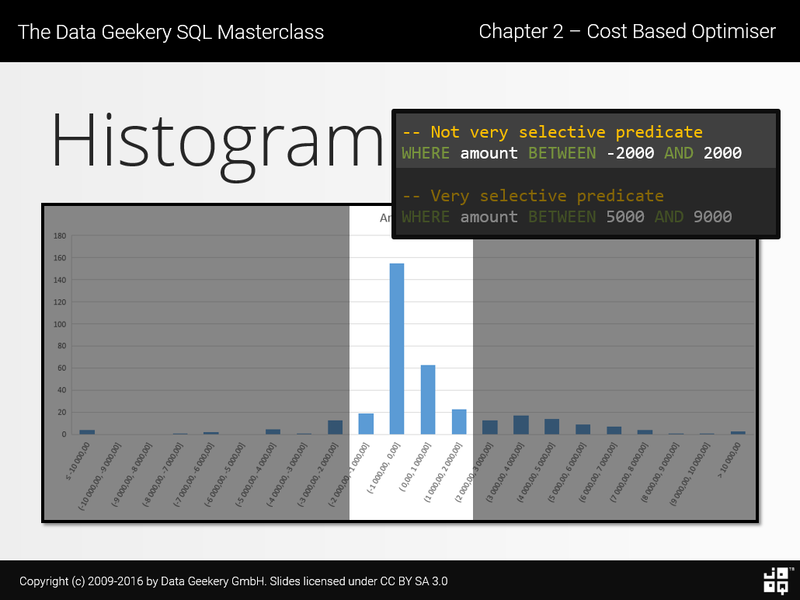 Only few bookings have an amount of several thousands, or if you’re an insanely good SQL trainer like me, several USD 100k, autographs included. That’s a classic bell curve, although nothing really indicates that you should have a bell curve rather than any other distribution of your data across your database. Let’s not delve into the different types of distributions but just accept the fact that there are some value ranges for amount that appear much more frequently than others, and that it’s not always easy to predict this distribution. So, what does this mean for a database? Both predicates query a range of amount whose size is 4000. The two ranges are of equal size. But do both queries return the same number of rows? In other words, are both predicates equally selective? Or, again, do both predicates profit from indexing? The answer is: Not at all! It’s not selective at all. We might as well scan the entire table to select almost 95% of our rows! Now we’re talking! Selecting only 2% – 3% of our data from the table. We’ll definitely want to use an index for this! I’m frequently surprised how many developers are shielded off from productive environments in a way that they don’t know about the importance of database statistics. Or maybe they know (that they exist), but they’re not sure about how important they are. This is extremely important, folks. Databases make a lot of decisions based on statistics, because cost based optimisers (most databases have one) will use a tremendous amount of information about your data (including statistics) in order to decide what algorithm is the best option to run your SQL query. There’s absolutely no way you could possibly figure out and manually write a better algorithm with a non-4GL language because your assumptions are always completely wrong when you go to production. That’s why SQL is so strong. Stuff still works because the optimiser adapts execution plans as your data characteristics change. It’s crazy to think that there are still some folks out there who think you (and your ORM) can outsmart a database optimiser when running a complex SQL query. You cannot. Just write the query in SQL already and use the power of your database! Obviously, you (both you the developer and you the DBA) must always ensure that your statistics are up to date. OK, they’re up to date, why is my query still slow? Check out the above histogram again. Real world histograms may work slightly (or entirely) differently, but the key here is that in our example, we only have 22 buckets of equal range size (e.g. amount BETWEEN 1000 AND 2000). Each bucket comprises a range [A, B[ where B - A = 1000. It’s just an example, but you get the idea. This is already great help in assessing that most of our data falls into the middle 4 buckets amount BETWEEN -2000 AND 2000. The way statistics are calculated is simple to understand. We can’t have an infinite number of buckets – we must keep the number of buckets small, because when we write a predicate like amount BETWEEN -2000 AND 2000, the optimiser will need to get a cardinality estimate from 4 buckets (in our example). Imagine the optimiser having to run through thousands of buckets to sum their sizes – it would take a long time for the estimate alone, and the optimiser has to evaluate a large number of possible execution plans to find the best one – we simply don’t have that time. So, statistics are high level approximations of our data. Fine, some error is probably OK, we’re still fast enough, right? In the following part of the post, I’m using the Oracle database, but everything I’m saying is true for other databases as well. When we’re in the domain of date time arithmetic, we humans often like to have dates or date parts in a human readable version. Date time arithmetic is hard enough on its own. Here’s some fun reading to illustrate what I mean. Let’s say we’re in the business of doing reporting. And in reporting (and accounting), we often like to have stuff aggregated by a YEAR_MONTH, i.e. something of the form YYYY-MM. The d_string and d_number columns will contain string and number representations of values like '201612', or 201612 respectively. Again, we could add a CHECK constraint, but that’s not the point. Yes, 564 is not human readable, but we’ll see afterwards why this is so magic for our query. The above query generates 100000 consecutive dates, truncates the YYYY-MM-DD format to YYYYMM only, orders the values randomly to have some more entropy in the test setup (don’t do this in real queries, btw!) and then stores each YEAR_MONTH value in each of the 4 encodings. Easy. And, of course, calculate statistics! Interesting! All of our cardinality estimates (the rows columns) are off, but the amount of rows they’re off is excessive for the middle two encodings (d_string and d_number). This leads to the database erroneously thinking that a full table scan is the best option when we query for those columns. On the other hand, the estimates on the d_date and d_number_continous columns are still “good enough” for the query to be reasonably run on the index. d_date “wastes” quite a few values in between each valid date, but that’s OK because the amount of values that are left out of the type’s domain is equally distributed across our data set. We always have between 27 and 30 days that never appear in our data. In other words, while we have gaps between our values, the uniform distribution will distribute values “evenly” in each statistics bucket, preventing side-effects in this case. d_number is similar to d_string and suffers from the same problem. There are 89 possible values between 201612 and 201701, which don’t really exist, but the optimiser cannot know this. Now we’re getting the inverse situation. Our cardinality estimates are way too low for the d_string and d_number column queries, which results in an index range scan that was estimated to be rather cheap, when it is in fact much more expensive. The full table scan is what we should be doing in this case, as it will ultimately perform faster for this query. For this example, we can conclude that sometimes we’re lucky (May – June), but very often we’re very unlucky (December – January, or May – August) and the optimiser will choose the wrong plan, despite our statistics being up to date. Intrigued? Want to learn more? 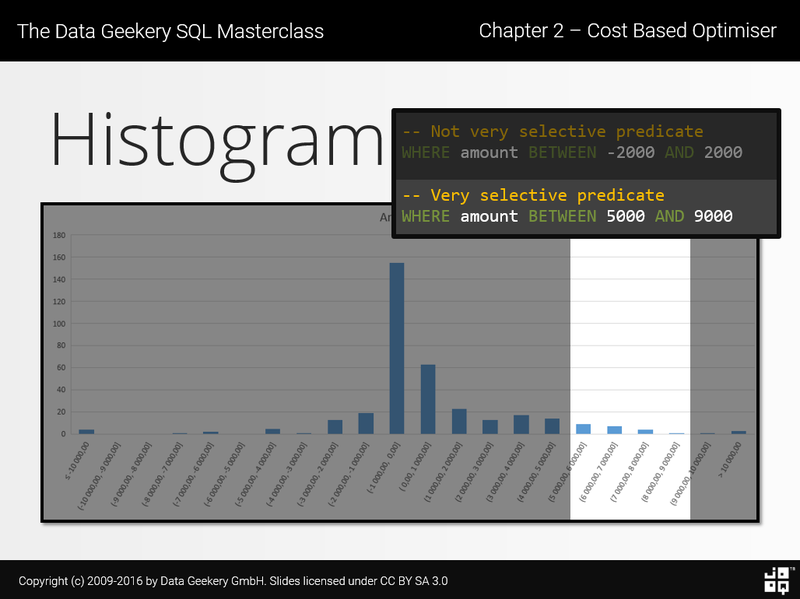 Book our SQL Masterclass!